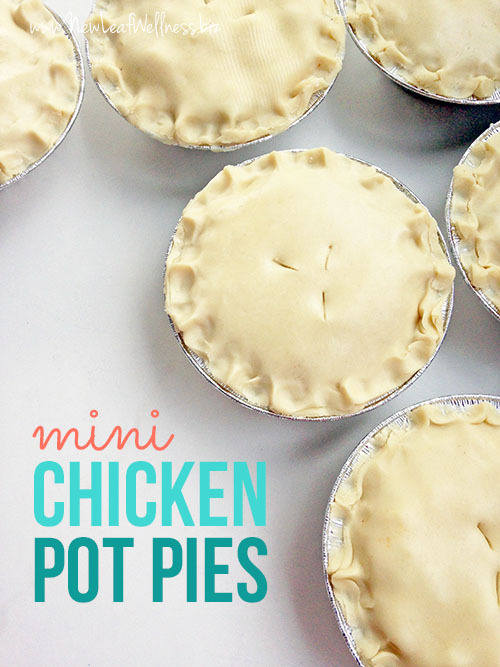 I’m kind of obsessed with these mini chicken pot pies. They taste like the ultimate comfort food and are the perfect meal to have on-hand when you only need one serving at a time. These mini chicken pot pies were inspired by my three-year-old and my grandparents. 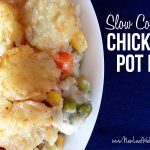 My daughter loves chicken pot pie and I’ve been wanting to make her a healthier option than the frozen stuff at the grocery store. I also like the idea of giving them to my grandparents, who simply can’t eat a whole 9″ pie. 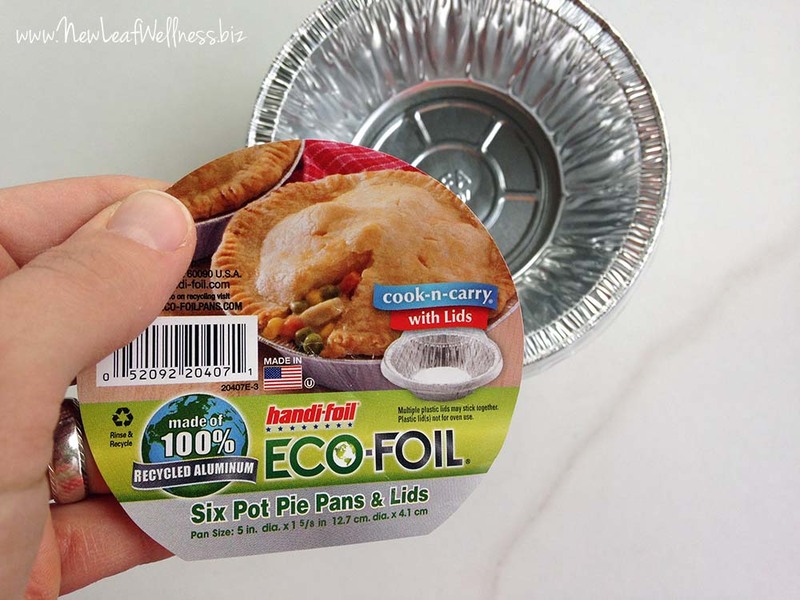 I actually looked up mini disposable pie pans on Amazon, but found them for sale at my local grocery store chain the same day! 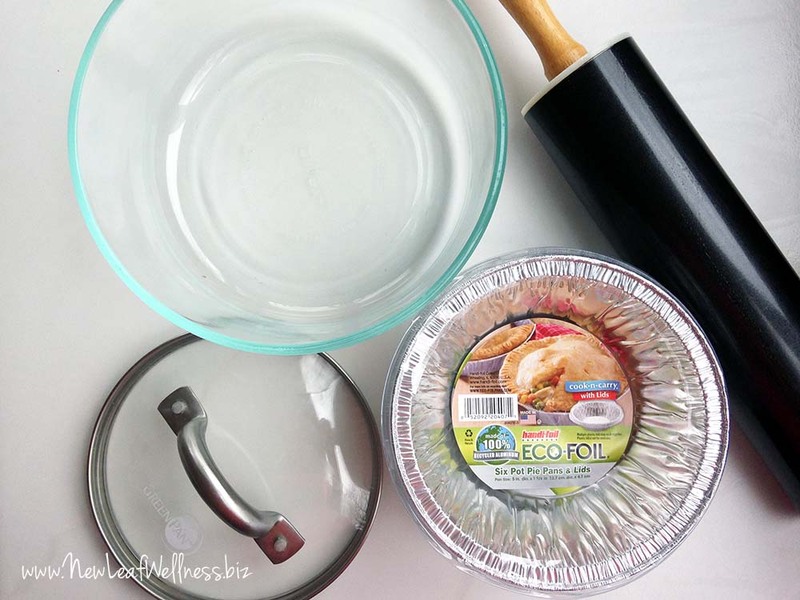 If we love eating these mini chicken pot pies as much I think we will, I’m going to invest in reusable glass mini pie pans next time (affiliate links). The thought of making my own pie crust totally intimidates me so I bought two boxes of the refrigerated stuff at the grocery store. They were on sale for 2 for $5 and I decided the extra cost was worth it. Overall, I spent $17.49 on the crusts, chicken, vegetables, and pans needed to my mini chicken pot pies. That works out to only $2.92 per pie! But, if you want to save money, making your own crust is definitely the way to go. To figure out how to cut the right size of crust for the bottoms and tops of my pies, I followed the advice on Everything Pies and measured all of the bowls and lids in my kitchen until I found two that were the right size. I love stocking my freezer with homemade meals, so froze all of my chicken pot pies. There’s no reason why you can’t bake your pies immediately instead though. Just make sure to shorten the cooking time so you don’t burn them. 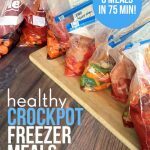 In a large pot, combine chicken, vegetables, and potatoes. Add water to cover and boil for 12 minutes, or until chicken is cooked through. Remove from heat, drain, and set aside. In a large saucepan, prepare sauce: Cook onions in butter until soft and translucent. Stir in flour, salt, pepper, celery seed, and poultry seasoning to form a paste. Add chicken broth and milk. Stir and bring to boil for one minute or until sauce thickens. Remove from heat, set aside, and cool to room temperature (about 30-45 minutes). 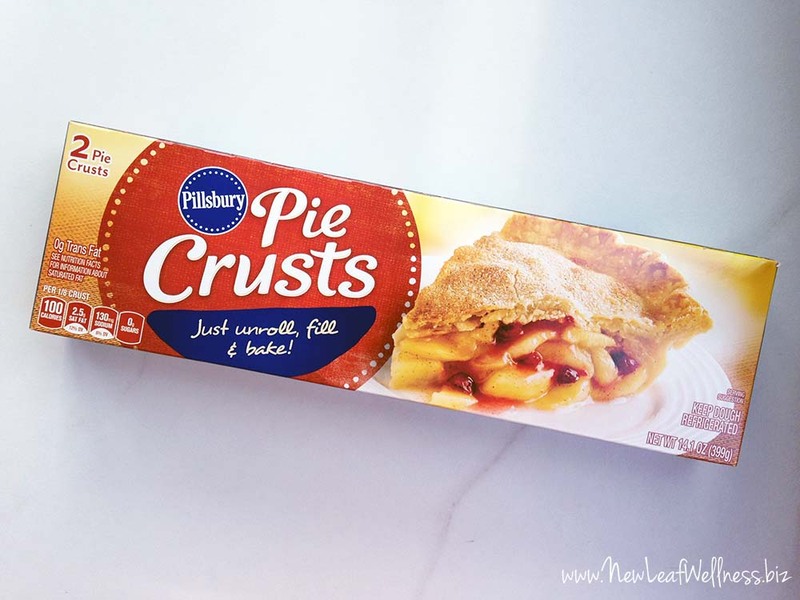 Prepare the pie crusts according to your favorite homemade recipe or the directions on the box. Cut the circles for the bottoms and tops of your pies and place the bottom crusts in each pan. 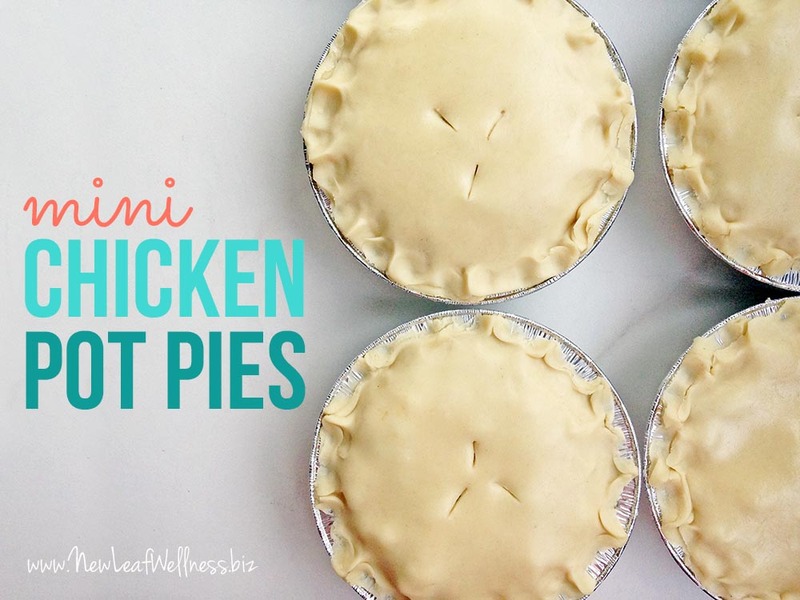 Combine sauce with cooked chicken and vegetables, and spoon into prepared pie pans. Cover with top crusts, seal edges, and cut away excess. Make 2-3 small slits in the middle of each top to allow steam to escape. 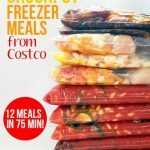 Place in the freezer for up to three months. When you’re ready to eat, pre-heat the oven to 350 degrees F and bake uncovered pies for 75 minutes, or until the crust is golden brown and filling is bubbly. Enjoy! 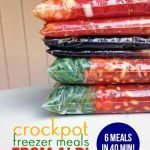 Great idea with the Pot Pies! Hands down, our favorite go to freezer meal. It is yummy and filling and my husband and daughter gobble it up! I use the same tins, too…the perfect size! I keep ours dairy free since we have a dairy allergy in the family. I’ve never tried a milk substitute. I would use whatever you typically use in recipes for him. Sorry I can’t be of more help. How is the bottom crust? Should it be par baked? I bake my bottom crust for 18 minutes at 390F. Home-made pie crust is not that dificult. I’m a man and have no problem with it. Sorry about that Sherry! There’s some kind of glitch with the files on my site. I just emailed your copies to you. Thank you for your purchase! Hi! I just ordered your cookbook ebook Bundle. I received the payment confirmation, but I don’t see anywhere on the email where I can download the ebook? Could you please help me out? Sorry about that, Janet! It should have been emailed to the email address that you entered with your mailing address immediately after purchase. I just sent new copies to the hotmail email address that you submitted with this comment. If you don’t get them for some reason, email me at kelly@newleafwellness.biz. I apologize for any inconvenience and thank you for your purchase! Do you have to freeze it first? Or can I just make it up and cook it that same day? I found another recipe that said the sauce would be too thin if it isn’t frozen first and then cooked. I’m looking for something to make today . . . so no time to freeze. No freezing necessary! I bake chicken pot pies the day that I make them all the time. How long do I cook them if I’m baking same day? might be a stupid question – BUT – do I freeze them before or after I bake them?? Kelly, I made these pies yesterday and they were delicious. I followed the recipe exactly and it made 6 pies using the 5″ foil pie pans, however I only had enough dough to make 3 top crusts, not 6. Can you tell me what your process was in order to get the 6 top and bottom crusts? I even tried rolling the dough further to try and stretch it some, but it was still not enough. Thanks! Are you sure that you bought four crusts? After I cut out my circles, I combined the excess and rolled it out so that I used all of it up in the end. Yes, each box contained two pie crusts, total of four. In think the way you saved the excess dough until the end is the trick. I tried using the excess dough after I cut the large circle from each crust, rolled it some, but that didn’t work. I will try again the way you described. Thanks so much Kelly.